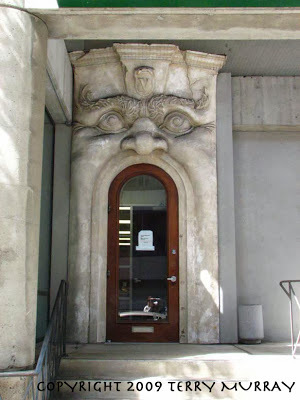 One of the last times I was in San Francisco, I was walking around in the area of City Hall and the Opera, and noticed this unusual doorway. I don’t remember what this door led to at the time, but it’s been a succession of financial institutions since it began life as the entryway to Vivande Ristorante, a second Italian restaurant opened in 1995 by chef Carlo Middione, in addition to his Vivande Porta Via, opened on Fillmore Street in 1981. Both restaurants have closed. I’m not sure when Vivande Ristorante died, but Vivande Porta Via fell victim to the recession at the end of 2009 — as well as to Middione’s loss of his senses of smell and taste as a result of a car crash in 2007. 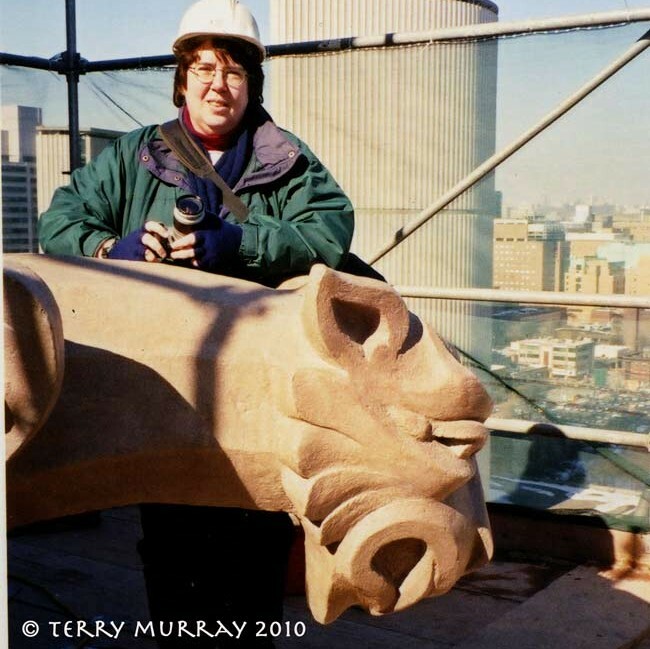 A 1995 story on sfgate.com, a division of the San Francisco Chronicle newspaper, attributes the 15-foot (4.6-metre) doorway sculpture to local sculptor Michael Casey. 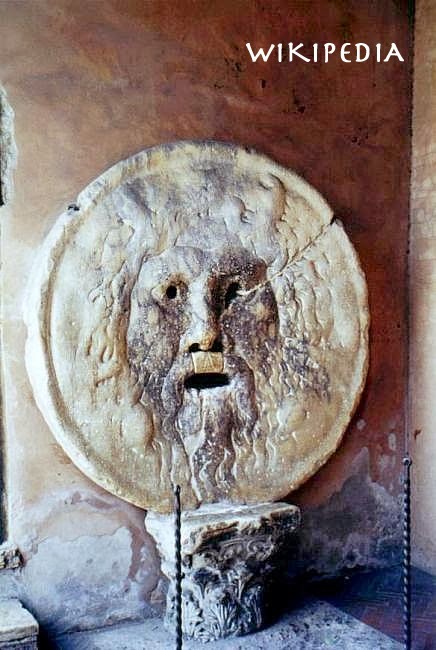 The article also claims the inspiration for the doorway sculpture is La Bocca della Verita (the Mouth of Truth) in the Roman portico of Santa Maria in Cosmedin. 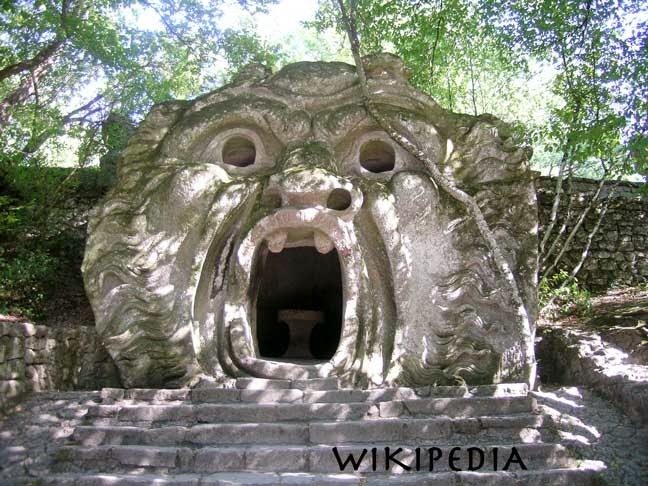 But in a 2011 blog post, San Francisco architect Larry Mock found it reminiscent of the Orcus sculpture in the the Sacro Bosco (“Sacred Grove”),known colloquially as the Park of the Monsters (Parco dei Mostri) and the Gardens of Bomarzo in northern Lazio, Italy, about an hour’s drive from Rome. Inscribed on his upper lip is “Ogni penser vola” — translated as “All thoughts fly” but also as “All reason departs”). I’ll leave it to you to figure out which the San Francisco doorway most closely resembles. I’m checking out flights to Rome! lovely article – had not seen this dorr before. Wonderful door – had not seen it before. Inspires me to go walking in the city! Hi Mare – this place is 670 Golden Gate Blvd.